Among present-day women composers, I have no doubt that Ellen Taaffe Zwilich ranks at the very top. Her music in the past 30 years or so has been consistently inspired as well as brilliantly crafted. 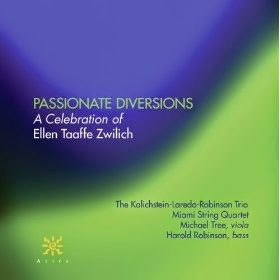 This comes through readily in a recent recording devoted to three of her chamber works, Passionate Diversions, A Celebration of Ellen Taaffe Zwilich (Azica 71292). The three works go well together, even though they cover the time span between 1987 ("Trio for Piano, Violin and Cello") and 2010 ("Quintet for Violin, Viola, Cello, Contrabass and Piano"), rounded off by the 2008 "Septet for Piano Trio and String Quartet". All three have an expressive, serious demeanor that is brought out well by the performers at hand--the Kalichstein-Laredo-Robinson Trio, the Miami String Quartet and guests. Musically an expanded yet tonal domain is the order of the day, with a blues-pentatonic feel dominating the Quintet, augmented, chromatic minor having its say in the Trio, and both juxtaposed in the Septet. It is music of a commanding drama, hearkening back to masters like Bartok while blazing its light into the future. One immerses oneself in the well-paced declamatory sequences all the more readily the more one hears the works. Very much recommended.